My father, Pete Pihos passed peacefully in his sleep at around 1:40 am the morning of August 16 after a long battle with Alzheimer’s disease. He was a great man but most of all a loving father. Pete Pihos began his nine-year National Football League career as a two-way end with the Philadelphia Eagles in 1947. When the platoon system was instituted, his coaches decided to have him concentrated on playing offense. Then in 1952, the Eagles suddenly found themselves in need of a defensive end. Without a second-thought they called on the versatile Pihos, who not only stepped in, he earned All-NFL honors. Then for the remaining three years of his career, he switched back to offense and led the league in receiving all three seasons. 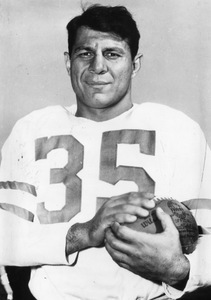 Pihos was the Eagles third-round draft choice in 1945, but two years of the military service prevented him from joining the team until 1947. One of the truly great iron men of pro football, during his nine seasons of play, he missed just one game. Immediately after Pete joined the Eagles, the team marched to its first divisional championship. In the playoff game against the Pittsburgh Steelers for the Eastern Division crown, he blocked a punt to set up the first touchdown in the Eagles 21-0 win. Philadelphia won three straight divisional championships and then back-to-back NFL titles by shutout scores. In 1948, the Eagles defeated the Chicago Cardinals 7-0. One year later, Pihos caught a 31-yard touchdown pass in the Eagles 14-0 win over the Los Angeles Rams. Although Pihos lacked great speed, he was a consistently outstanding pass receiver with sure hands, clever moves, and courage. Any defender who battled Pete for a pass was bound to get the worst of it physically. He played it clean, but very hard and, after he caught a pass, he ran like a bulldozing fullback. Pete led the NFL in receiving from 1953 through 1955 and earned first-team All-Pro or All-League honors six times and was named to six Pro Bowls.